The message I see is "Gradle project sync failed. Basic functionality (e.g. editing, debugging) will not work properly" as shown in snapshot below. Do I need to have a local distribution of gradle? Where do I download it from and where do i put it? How do I now tell Android Studio to use it? (as you can tell, I don't understand how gradle works). Thanks for any help. If not do install it from SDK Manager > Extras > Google Repository first. I ran into this problem and found I already had the location of Gradle set and already had the Google Repository installed as mentioned by pyus13. My solution was switching Android SDK Build-tools to a previous version fixed the problem. The latest revision was 19.1, but updating to that broke the tool chain. It could just be as simple as trying another Build-tools. Well i dont know what worked for them but for me worked to add a little scripts to build.gradle. DO note its important to put them at the top of the page (in build.gradle). THEN: in buildToolsVersion I had a version 19.1.0 and there for I installed build-tools (SDK manager) version 19.1 & 19. I uninstall other build-tools packetes, im not a fan of useless stuff. And you should be good to go, hope it helps someone..
Well, I don't know what worked for them, but for me worked to add little scripts to build.gradle. Do note that it's important to put them at the top of the page (in build.gradle). Not the answer you're looking for? 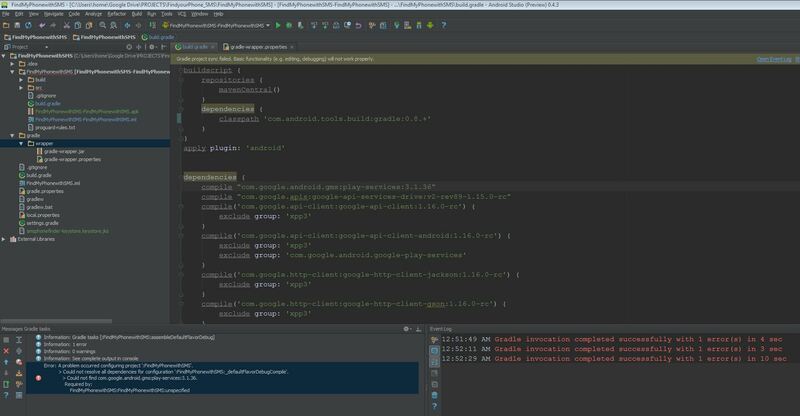 Browse other questions tagged android ide gradle android-studio android-gradle or ask your own question. What is the purpose of Gradle?